Lessa did make it to the fair! I finished the sleeves and got it washed and blocked in plenty of time. Okay, so it was just a teeny bit damp when I left the house, but it was dry by the time I got it checked in! I also entered my Paua Shell Tank and a skein of that yarn – but NOT one of the unplied ones. I have several skeins left, and am still trying to decide what to do with them. In brief, I didn’t win anything on either of the sweaters, but I certainly wasn’t expecting a repeat of last year! They only do the top three placings here, and since there were no comments on the tags, I have no idea what the judge thought. They were both entered in the same class, which appeared to be the largest one, but I couldn’t argue a bit with the selection of the class winner! I saw it when checking in my entries and knew right away that it deserved top billing. It was a reversible, double-knitted coat from M’Lou Baber’s book “Double Knitting: reversible two-color designs“. If you read my previous post, you know that the author, and therefore the knitter, owe something to Beverly Royce. Everything really IS connected, isn’t it? 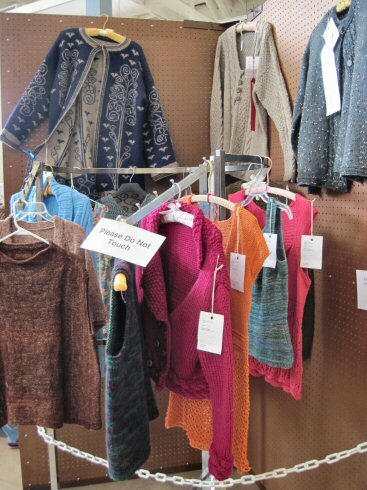 Class winner at upper left... my Paua Shell Tank is on the rack, between the orange and red sweaters. I had noticed when I was filling out the online entry form that there is no class in the Hand Knitting category for “Handspun Finished Article” as there is in the Weaving category. So when I went to check in my entries, I found the highest-up person I could find in the building and asked about adding such a class. I explained that many spinners are knitters, but not weavers. She was quite open to the idea, so I plan to send a follow-up email to see what I can do to help it along… like come up with some sponsorship. As I said, there were no comments on the tags, which was kind of disappointing. I would have liked some constructive criticism – or a compliment! Although the criticism would be more interesting and possibly enlightening. However, I can guess what one comment might have been on Lessa: “Be sure to weave in ALL yarn ends”!! I didn’t realize until I got it home that I had missed a couple. Such a careless oversight. *sigh* Even so, it was apparently selected for face-out display. Although I haven’t quite figured out why it looks funny on the hanger, unless it’s just the fact of being on a hanger in a more or less flat plane when it was designed and knitted in 3-D. I decided as I was finishing it that I would rip out and redo a section as soon as I got it home, though. I’m not happy with the rate of decreases – and therefore the fit – between the waist and bottom of the armholes. So I’ll run a couple of lifelines, rip back 3 or 4 inches, reknit back down and graft it together. I am happy with the hem, and am not about to redo THAT. 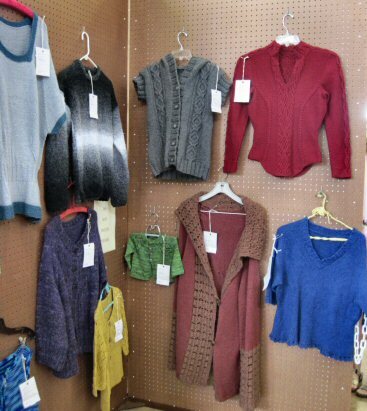 More of the sweater display, with Lessa at upper right. However, it was a different story in the handspun yarn class! 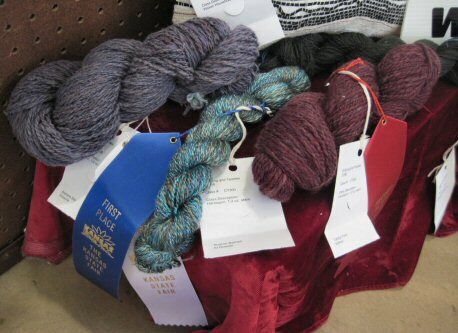 I looked around for the display of skeins, and found mine with a blue ribbon attached! That was very gratifying. The other yarns looked quite nice, and I’m happy to see a good level of competition. I think I need to do a little ‘boosting’ of the class at my next guild meeting and see if we can get more entries next year. Skeins of handspun yarn. They were all nice! Interestingly enough, the premium for winning that class was almost double the premium for first place in the women’s sweater class! So this year, I came home with a check for $11.00. That’s a nice little incentive for entering something next year, too. I received a red ribbon in weaving, handspun, finished item. The blue ribbon went to a handspun handknit shawl.